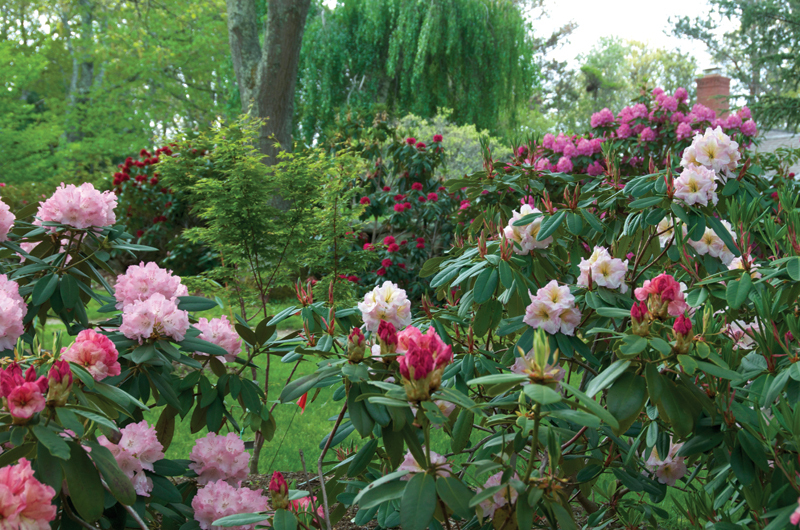 Peter Norris of Chilmark is on a quest to create the holy grail of rhododendrons. Until recently, rhododendrons were a part of creation that I rarely considered, except possibly at a shingling job site, wrestling with one next to a building while trying to get staging up. Then I met Peter Norris of Chilmark. “There are some here that can’t be found anywhere in nature, or in the world,” Norris told me, and then explained that with the help of his assistant, Suzy Zell, he works hard to propagate new hybrids, a process that can take up to four or five years to determine success or failure. 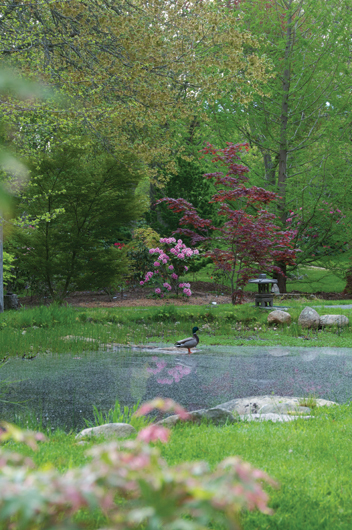 More than a thousand specimens of rhododendrons grace the fourteen-acre property of Peter Norris. “I don’t know...I really don’t know,” he replied. Labrador tea,” for instance, but some species of rhododendron have played important roles in history – more specifically in the history of war. One variety is poisonous to humans, and as it turns out Greek soldiers were stopped in their tracks when they consumed honey from the pollen of such plants in 401 B.C. Pompey’s troops fell prey in 66 B.C. when they ate honey left behind by Pontic forces. So rhododendrons have been used as weapons. Thankfully, these days, in Chilmark, they are used for peaceful purposes. rhodies. In the 1970s, when he and his wife, Amy Rugel, were based in Cambridge, they began renting summer houses on the Vineyard, and in the late 1980s they bought a small cottage in West Tisbury. Doing well in his career and with no more room to plant, in 2000 Norris traded up to a fourteen-acre piece of land with a nice house. He converted a garage that had been used as an animal shelter by the previous owner into a sunroom, and today over four acres of the property are dedicated to...you guessed it: rhododendrons. From the beginning of April to July the plants begin to flower. But it is a slow process, and it isn’t until June that you see all of the colors, when the bulk of the plants begin to bloom. He was hooked. But he still had more to learn. 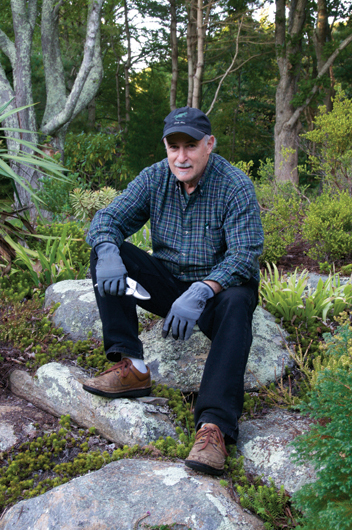 At home one winter about six years ago, he noticed a problem with some of his plants. They had big leaves that the wind would catch. By the end of the season all the leaves had been ripped off, which is when his scientific/engineering side kicked in and he decided he wanted to find a solution. 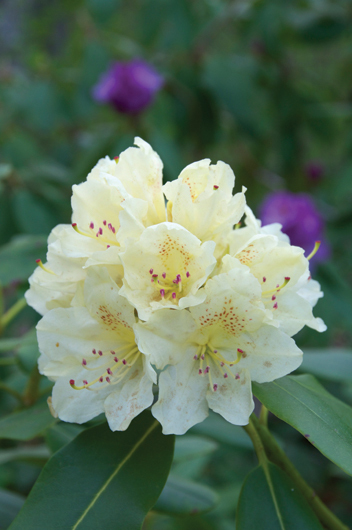 It so happened that around this time Norris took a trip sponsored by one of the rhododendron societies – yes, there are such clandestine groups lurking in our community – to China to see the varieties that grew there. While visiting a grove on a steep mountaintop, he noticed that some of the plants had very thick stems where the leaves met the branch, and it occurred to him that if he could learn how to cross this species with what he was growing on the Island, he could solve his problem with the winter winds. He became a propagator of hybrids. 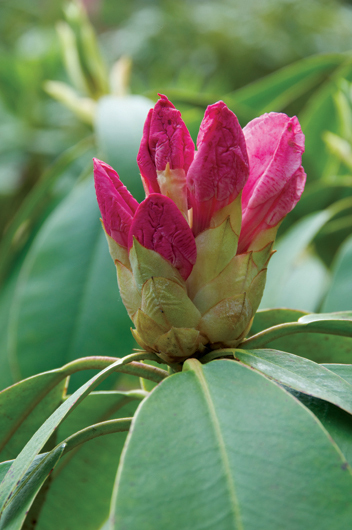 Part of the challenge with rhododendrons is that in the wild they live in a wide range of environments, from subtropical to mountain environments such as the Himalayas. But if you want the subtropical flower with the hardy northern species foliage, it’s again, as he said, somewhat of a crapshoot if it will work out. “The joke is, it’s like the marine biologist who crossed the trout with the jellyfish hoping to get boneless trout, and instead gets bony jellyfish,” he said. Kudos to Mr. Norris! Rhodies are a tremendously beautiful plant. When I left my Cape Cod home six years ago to live in China, I was pleased to find many species of the rhododendron here. A bit of New England in China!